FACT: Negate 37WG combats poa annua for residential turf! Make it simple, make it Negate 37WG. 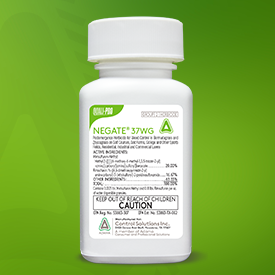 Negate 37WG is a unique dual powered post-emergent Sulfonylurea herbicide for grassy and tough broadleaf weed control in established warm season turfgrass. Contains Rimsulfuron 16.67 percent, Metsulfuron methyl 20 percent. Available in 1.5 ounce bottle. This winter, combat Poa annua with Quali-Pro’s Negate 37WG (newly labeled for residential turf). This annual winter grassy weed (Poa annua) is one of the biggest thorns in the sides of lawn care companies, and homeowners. Negate 37WG provides superior control of Poa annua and other listed weeds on golf courses, sod farms, sports fields, industrial, commercial and residential lawns. Locate a distributor today! Visit www.quali-pro.com.